Florida isn't the worst state for poker players, but it isn't the best either. On one hand poker players are able to play in home poker games, licensed clubs and casinos. However, casinos and home games have to deal with lots of rules to stay compliant. Intrastate poker legislation has been introduced to inject revenue into the state. On the other hand, the bills were shot down and Florida has recently banned the operation and use of internet sweepstakes cafes. It’s possible that these laws carry over to online gaming. Do you see what I mean? It is possible to play poker in the Sunshine State, but it could be much easier and player-friendly. Read on to see exactly what I mean. Like most states online poker isn't specifically addressed. There is nothing stating that online poker is legal, or that it’s not legal. However, there are sections of Florida law that might push you to think that online poker is, in fact, illegal in Florida. Whoever plays or engages in any game at cards, keno, roulette, faro or other game of chance, at any place, by any device whatever, for money or other thing of value, shall be guilty of a misdemeanor of the second degree, punishable as provided in s. 775.082 or s. 775.083. Poker is a card game and according to Florida poker is a game of chance. And online poker sites do not cap how much you can bet or win per round, therefore preventing online poker to fall underneath the social / home game exception. These points lead me to believe that online poker would be (or is) considered illegal in Florida. Home games are only acceptable if you stick to the "pennie-ante" rules. (a) "Penny-ante game " means a game or series of games of poker, pinochle, bridge, rummy, canasta, hearts, dominoes, or mah-jongg in which the winnings of any player in a single round, hand, or game do not exceed $10 in value. Players must also be 18 to participate. Other than that, home games are legal so long as no one is profiting from operating the game -- like taking a cover charge, rake, profiting from food and so on. Do Casinos in Florida Offer Poker? There are casinos that offer poker in Florida. One of the more popular casinos is the Seminole Hard Rock Hotel and Casino in Hollywood. They're known for running deep-stack guaranteed tournaments and WPT events. Limits of $2 per betting round. Rooms can only operate for a 12 hour period, per day. Players can only receive $100 of chips at a time. The only thing to keep in mind is that these boats must be at least 9 miles off shore to prevent any legal problems. We receive a lot of questions about Florida poker law. We thought it'd be helpful to post those questions and our answers here. 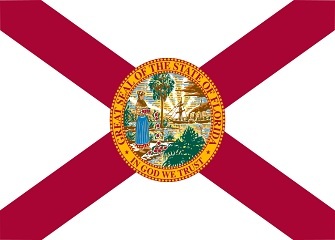 Will online poker be regulated in Florida? It's not looking that way. Not any time soon, at least. Efforts have been made, though. Florida state rep Joseph Abruzzo introduced a bill to regulate intrastate poker in 2010, but it failed and was pulled in April of 2011. Other than bills failing, another challenge to introducing online poker to Florida is the attitude towards and recent banning of internet sweepstakes cafes. The ban was put into effect in 4/2013. Both (poker and sweepstakes cafes) are considered games of chance, so I think that might impact legislators opinions on whether to regular poker or not. There is a current contract with the Seminole Tribe, too, which the new law(s) would have to comply with. In short, online poker regulation will be a challenge. But it’s not impossible. Is there an online poker room that accepts players from Florida? Yes, Florida players can play at Bovada, Sportsbetting Poker and BetOnline. What other forms of regulated gambling is offered in Florida? Florida residents can bet on horses and dog races. There are casino games, bingo and the state lottery, too. Where can I read more about Florida poker laws? Here are some interesting gambling themed facts about Florida. Florida casinos have $100 caps on their table games. However, it's possible to take a ship offshore to play high stakes games. It's illegal for you to gamble or bet on racing within one mile of a religious camp. Several pro poker players call Florida home. One such player is Cardplayer Magazine 2006 Player of the Year Michael Mizrachi. He has won numerous events including the 2010 and 2012 WSOP $50,000 Players Championship, 2 WPT titles and he finished 5th in the 2012 WSOP Main Event. In 2010 Mizrachi faced a tax lien of over $300,000, which were related to unpaid taxes on his 2005 to 2007 earnings. He also had to foreclose on 2 properties. Fortunately for him these hiccups have had no effect on his ability to play well.